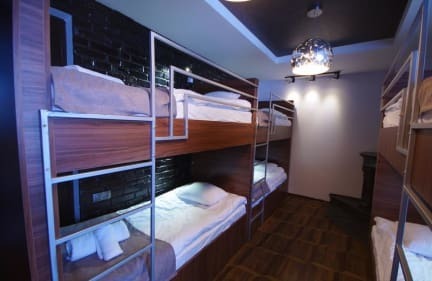 Really nice hostel with great atmosphere in central Batumi. The host Mamuka and his friends took very good care of us and introduced us to the Georgian traditions. Thank you!! Excellent hostel, very comfortable, great location, helpful staff! We had a private room, which was very nice and clean. The breakfast in the morning costs extra (I think it should be included in the price), but is really nice. The staff was very friendly and helpful. The only thing that we didn't like was that the bathroom was quite cold. Beautifully laid out. Great facilities. Comfy beds. This place is great. I'd stay again. Overall, I really liked the hostel (facilities, staff, location, etc.) and I believe I would have liked it even better in the summer with other travelers in the hostel! Although, there is just one thing I quite find ridiculous when they have asked me to pay for changing the bed (when I did not have any other choice since other beds were not cleaned and no coverings at all). I mean, we could have agreed to something and hear me out than directly asking me to pay. A clean, and comfortable place to stay in Batumi. Big and modern beds with curtains for privacy. No lock on the room door. The shower head was broken but at least there was boiling hot water. Staff very friendly. Walking distance to the beach and main attractions. I would recommend to have more toilets in the dorm, only one toilet/shower for 6 people. Deft recommend!